Craig is a passionate and innovative musician. 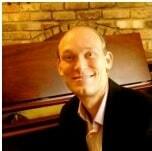 He has taught piano lessons for 18 years and loves teaching students of all ages and abilities. Craig believes in nurturing each student as they discover the joys of music. His early musical experiences – Suzuki, Beethoven, and Chopin, improvising jazz, and arranging popular tunes –guided his music exploration. As a pianist, Craig holds a master of music degree in piano performance from Manhattan School of Music and a bachelor degree in music from the University of St. Thomas. His primary teachers were Zenon Fishbein, Katherine Faricy, and Seymour Bernstein. He has recently been active as a pianist, conductor, composer, and improviser in NYC, where he lived for 11 years.